Stone Age Diet Easy in the next 10 minutes! If you're starting a Stone Age style allergy, exclusion, elimination or candida diet, you're probably wondering just how you will cope. Excluding basic foods like bread, pasta, pizza, pies, crackers and cereals as well as all foods containing yeast, chemical additives and preservatives and artificial colours, flavourings and sweeteners can feel like an insurmountable obstacle and you don't know where to start. Leaving these foods out and eating more of the foods you are allowed seemed an option at first - until you realised just how many of the foods in the supermarket contain ingredients you are not allowed. 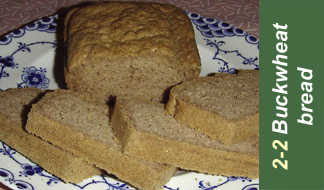 You may have discovered some gluten-free and possibly even wheat-free breads, but then realised with dismay that they are no use to you because they still contain many of the other ingredients you must avoid, such as corn, soya, yeast, sugar and manmade chemicals of all kinds. 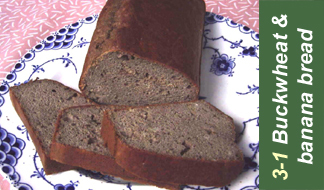 You may even have to exclude rice and potato flour on your Stone Age Diet, which means that just about all of the bread and bakery products on the 'special diets' shelf are unsuitable for you. Perhaps you'd already resigned yourself to not being able to eat biscuits, cakes and desserts. But you hadn't realised that you wouldn't even be able to make a sandwich for your lunchbox, or toast for your breakfast. You're wondering how long you'll be able to stick to the diet without your favourite foods, and you don't know how you're going to find the time in your busy life to cope with your new way of eating, either. If you're following the Stone Age Diet in order to identify and treat food sensitivities, you have probably been given a list of 'uncommon foods' to eat, such as millet, buckwheat, tapioca, quinoa and chickpea or gram flour. But you haven't got the faintest idea of how to make them into something edible with the restricted list of other ingredients you're allowed. You're thinking that eating was once a pleasure, but has now become a chore. In short, you're pretty close to giving the whole Stone Age Diet idea up. 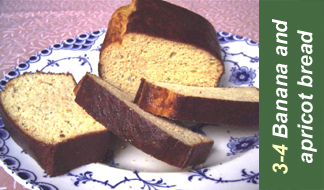 What you need is quick and easy recipes for bread and bakery items which are made from flours that are free from wheat, gluten, soya, corn, yeast, sugar and artificial chemicals. 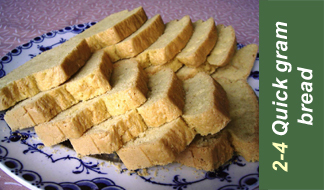 You need recipes which are easy to make and tasty to eat. 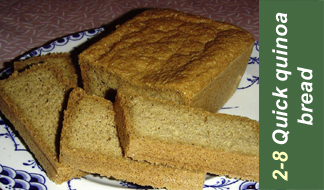 Bread recipes that will bring you the convenience of being able to make a sandwich or toast, and biscuit, cake and dessert recipes to replace the treats you most miss and help you keep on your diet. Most importantly, you need recipes which are tried and tested and approved by specialists who use the Stone Age Diet to help their patients conquer health problems caused by food sensitivities, intestinal yeast overgrowth (candida) and other diet-related conditions. When my husband was first diagnosed with food sensitivities and intestinal yeast overgrowth and prescribed the Stone Age Diet, his first reaction was to eat the foods he recognised on his permitted foods list and leave out the ones he didn't. He didn't want me to make him special meals – he would just eat the foods he was allowed. However, he soon found that this didn't give him enough to eat, and he also began to crave a wider variety of textures and tastes, such as the crunch of a biscuit or cracker, the springiness of bread or the taste of cake. Ravenously hungry and suffering from bouts of dizziness and low energy, he was dropping even more weight from his already slim frame. Luckily, I already had some experience of developing recipes for special diets using substitute ingredients. So I set about developing bread and baking recipes to suit his Stone Age Diet. It took a lot of experimentation but eventually I succeeded in making alternative versions of the foods he missed most, he was no longer weak and hungry all the time, and best of all, he started to enjoy his food once again. Most of the recipes in the Stone Age Diet is Easy Cookbook take just minutes to make, having been designed with busy people in mind. The recipes are clearly set out and easy to follow. Ingredients are given in metric, imperial and cup measures, so the recipes are already converted for British, American, Canadian, Australian and all other Cookbook users. Where recipes use the microwave, alternative recipes using the oven are given too, in response to the growing number of people who prefer not to use the microwave. Main meals are not so much of a problem, but breakfasts, lunchboxes, and snacks on the move become very difficult when you can't have the cereals, bread and other baked goods you find in the supermakets. 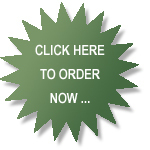 The Stone Age Diet is Easy Cookbook solves all these problems for you, and helps you stay motivated to stick with the special diet which is going to give you back your health. The Stone Age Diet is Easy Cookbook concentrates on quick solutions for the meals and foods that are most problematic when standard ingredients such as wheat, gluten, barley, oats, corn, soya, yeast and sugar have to be eliminated from your diet. 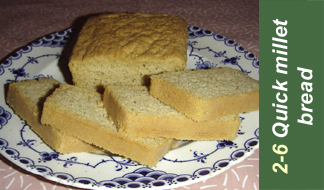 Focusing on bakery items such as breads, biscuits, cookies and cakes, the tried and tested recipes make maximum use of the alternative flours that, thankfully, are increasingly available. The Cookbook also contains lots of useful ideas for main courses and snacks, information on substitute ingredients and tips on how to adapt your way of eating to cope with your new diet. 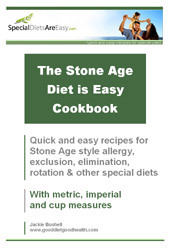 The Stone Age Diet is Easy Cookbook is endorsed by Dr Apelles Econs MRCS LRCP, Specialist in Nutrition & Environmental Medicine and Director of Allergy Medical UK. Through the years, many of the patients we have helped to overcome chronic digestive or other problems have left me in no doubt that changing to healthier eating, initially, doesn't come easy. Nor is it cheap. Spending time and effort to find less reactive foods and then having to work out how to concoct a reasonable meal with these foods often adds to life's daily pressures. It is easy to offer a list of foods to avoid and a list of foods to eat, but even the most relaxed elimination diet demands a degree of self-discipline and time to think seriously about basic sustenance, because one's very habits are being challenged. Food is known to have a powerful hold on us, if intolerance is the main underlying problem. The more practical the diet is, therefore, the more likely you are to succeed with implementing it. Jackie Bushell, having mastered low carbohydrate cookery over the years, has spent many hours patiently experimenting with the materials used in the Stone Age Diet. Tasting some of the samples of scones and cookies she prepared was surprising and delicious. In the past, using uncommon ingredients without specific recipes meant that for some of our patients, a number of useful foods were easily overlooked. Yet in Jackie's recipes, the same foods become useful, palatable snacks, adding interest and substance to a healthy diet. Thankfully, the majority of patients with symptoms caused by food intolerance will, in the long term, be able to modify their diet and remain healthy, when the time comes to relax it. I feel that Jackie has made this transition much easier, maximising the variety and choice available today. Your new diet: a life sentence - or does it get better? When you first go on a Stone Age style allergy or exclusion diet, it's easy to settle for a very limited range of foods, because you don't know how to incorporate the 'uncommon' foods you're allowed into your meals. With the Stone Age Diet is Easy Cookbook, you'll discover how to expand your food choices in an enjoyable way. You'll be able to have bread, cookies, cakes and desserts once again, whilst still following your special diet. "I think the cookbook has lots of great ideas on how to incorporate alternatives to many of the common allergens." "I just had my best meal in weeks - poached egg on toast (the gram flour flat bread) with garlicky green salad and it was fantastic!" "I have found the book really helpful, so many thanks"
The Cookbook will transform your meals, making possible all those foods you have been missing such as bread, cookies, cakes and desserts. Because The Stone Age Diet is Easy Cookbook is a downloadable e-book, you won't have to wait for it to be shipped, so you could be getting started today! PDF format is the most popular and compatible file format available, so the e-book works on just about any computer operating system. All you need is a copy of the free Adobe Acrobat Reader (iPad requires installation of a free PDF reader app). You can view on screen or print out and put in a ring binder for your kitchen shelf. Buy it now and you could be making your first recipe within minutes! 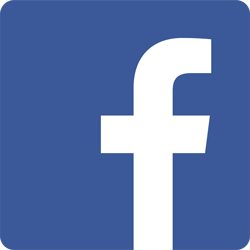 As the Cookbook is (only) distributed electronically, we can minimise production and distribution costs, and therefore keep the price down to only . That's all - no shipping costs! 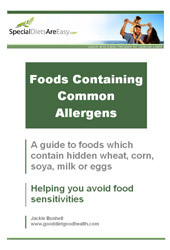 A detailed 10-page guide to the many foods which are likely to contain common allergens. There are separate lists for foods containing hidden wheat, corn, soya, milk and eggs. Valued at £7.97. A handy guide to the foods you can use as substitutes for wheat, corn, soya, milk and eggs. A 17-page guide to foods high in the essential nutrients. On a restrictive diet, you may be missing out on certain vitamins, minerals and other important elements. 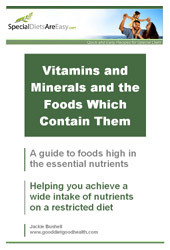 These tables will help you identify any nutrients which your current range of foods lacks, and work out which alternative foods you can eat to replace the nutrients provided by the excluded food. Valued at £7.97. The total value of the Stone Age Diet is Easy Cookbook and all 3 super bonuses is £28.91, but they are all included when you order the Stone Age Diet is Easy Cookbook for only . And that's all you pay - there are no shipping costs to add! And because the Stone Age Diet is Easy Cookbook is an e-book, you won't have to wait until it's shipped, so you could be getting started on the delicious recipes just minutes from now. The Stone Age Diet is Easy Cookbook also comes with a one year guarantee. We're so sure that you'll be satisfied with the recipes, that you can return the e-book anytime up to 365 days after purchase, and we'll refund your entire payment. So there's no risk to you, and nothing to lose! P.S. Don't let boredom with your food choices, lack of convenience or cravings for your favourite foods cause you to give up your special diet. The Stone Age Diet is Easy Cookbook will give you invaluable help for these problems and ensure you can stick with your special diet while it does its work and restores your health. 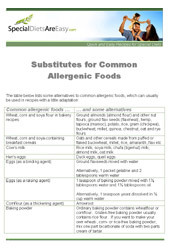 "Substitutes for Common Allergenic Foods"
"Vitamins and Minerals and the Foods Which Contain Them"